Another great news for Chennai Super Kings. VB & Co. have been successful in convincing Venkatesh Prasad to become a part of Chennai Super Kings Support Team. The move looks like a master-stroke especially after the shifting of IPL matches to international venues. I am sure Venky's expertise and experience would be of great help to Gony, Tyagi, etc. who have little experience of international pitches. 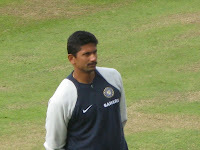 Also Venkatesh Prasad would be playing a perfect foil to Stephen Fleming. Venkatesh Prasad! Chennai Super Kings Fans, Welcome you to the squad. Hope to see a much improved Chennai Super Kings bowling Unit this season.